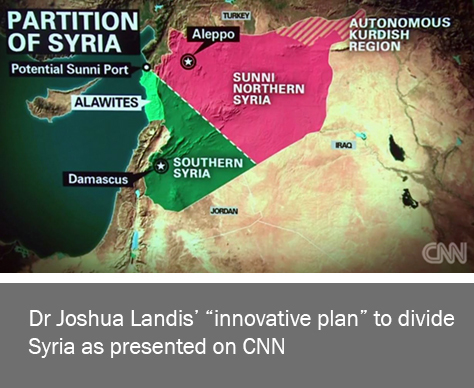 Dr. Joshua Landis has a simple solution/plan for Syria: To divide the country into a state for Bashar Al-Assad (south and west, including Damascus) and a “Sunni Northeastern Syria” in the north and east (including Aleppo). The “innovative plan” (as it was introduced on CNN’s Fareed Zakaria GPS) hopes to “draw the Turks into Syria with Saudi American backing to try to disarm the militias” and to “Accept that [Sunni] state but try to get better rulers for it, not ISIS”. There are numerous challenges that, in my view, render Dr. Landis’ plan inapplicable, .. at least not in a manner that “the international community” can be proud of. First, there is no straight-line that separates Syrians by sect. Most cities or towns are inhabited by a mix of Syria’s various religious groups. Dr. Landis explained in another interview (at University of Denver) that a division of Syria will likely be extremely bloody. Major sectarian cleansing and population transfer of millions will be required to split Syria. It is understandable why Fareed Zakaria opted to not question Dr. Landis about these details. Second, getting Turkey and Saudi Arabia to cooperate on this Syria project will require serious arm twisting … and will still not be sustainable. Saudi Arabia’s Wahabis will not be easy to get on board as the international coalition try to shape the new Sunni state as a modern, relatively secular entity, assuming this is what Dr. Landis meant when he suggested trying “to get better rulers”. Third, Iran and Hezbollah will likely find it justified to expand their activities in the region in response to attempts by Turkey, Saudi Arabia, and the United States to split Syria in two. Fourth, ISIS and other Jihadist groups would be able to rely on more local support if it is perceived as a victim of concentrated attacks by the US and its allies especially that their declared intentions including splitting Syria (or Bilad Alsham) and giving Damascus (The Umayyad capital) to the other state. Fifth, the Syrian government, Syria’s national army and millions of government supporters will not give up Aleppo that easily. They plan to liberate it from the Jihadi rebels within the next few months. In fact, Jamal Marouf, leader of American supported “moderate rebels” did admit that “Aleppo is falling” to the Syrian army. Robert Fisk believes the Syrian army will most likely recapture Aleppo and most of the east and the north as well. One can find government supporters who are ready to give up the eastern part of Syria to an Islamist state if that would end the conflict. But very few will opt to stop the fighting at the cost of losing Aleppo… especially not if Mr. Erdogan is the subcontractor in charge. And finally … “the autonomous Kurdish region” is too small to be secure between Turkey to the north and the not-so-liberal “Sunni Northern Syria” state to its south. Will Turkey capture that part of Syria? will the mostly liberal Kurds be forced to adopt and adhere to the strict lifestyle of their pious neighbors to the south? So what to do about the sectarian divide in Syria? 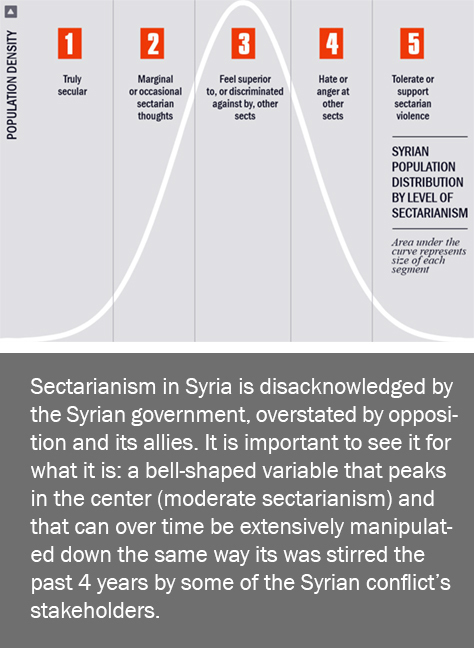 One needs to recognize that “sectarianism” is not an On/Off variable. Sectarianism is a complex construct that comes in various colors and intensities. Some need to be dealt with, others are benign. A reflection of convictions of religious-mandate (from God) or intellectual superiority: “Sunnis are the only true Muslims” … “only through Jesus you can go to heaven” … “we, the Druze/Alawites/Ismaelis are philosophical and progressive unlike those dogmatic backward Sunnis” … etc. Power (usually military or financial) driven: The 1979 revolution in Iran contributed over the years to Shia pride throughout the Middle East. Saudi Arabia’s wealth contributed to Sunni pride. Tribal: Many belong to various religious group without subscribing to their philosophical values. Perhaps not unlike tribe-pride, or even soccer-team pride: “Argentina is the best soccer team on earth … NO … Germany is”. Hate or revenge driven … when a religious group has a score to settle with another religious group that committed violence against it or robbed it of its perceived rights. (Post Hama for example). The highly sectarian (groups 4 and 5) tend to be more active in the conflict. They represent a part of the population that should not be ignored or, inversely, assumed to represent the sentiments of the majority of Syrians. Sectarianism is present among all religious group (majority, or minorities) or political ideologies (pro or anti government). Ending the conflict and taking steps to fight sectarianism would be expected to push the average level of sectarianism lower. Another, perhaps more nuanced and developed, plan was shared with me a few weeks ago. A 55-page (work-in-progress) document prepared by UN mediators with the help of a number of European (Swiss, Norwegian… ) conflict resolution NGOs that benefit from extensive access to decision makers and other influential figures among the antagonists of the Syrian conflict. Washington Post’s David Ignatius expressed serious doubts about this plan. He continues to belong to the group of experts that are committed to arming the “moderate rebels” as the only way to settle the Syrian conflict (to their liking). Reconcile the two sides (government and rebel) one rebel group at a time: Government agrees to not humiliate or disarm the rebels … the rebels recognize the Syrian government and army’s authority. Decentralize: a negotiated limited autonomy would be granted to various regions. The document reflects an impressive degree of realism and pragmatism that was previously uncommon in western circles. For example, one of the proposals for trying to limit the flow of Jihadists into Syria is to stop promoting the narrative of “Sunni victimization” in Syria by media and governments. Another demonstration of rationality can be found in an interview with one of Syria’s leading security agencies. He admitted that the government is not seeking total victory … he admitted there is a stalemate. The Syrian government is willing to tolerate time-limited and local rebel presence (acting as a neighborhood police force) but not the de facto regional rebel-led governance as the plan seems to propose. It is unlikely that all of the 1000+ rebel groups will sign on the plan. Even those who sign will not always respect the terms of the agreement. Non-state actors are notoriously unreliable. Two years ago, during a meeting between three of our Syrian dialogue project members and Russian foreign minister Sergey Lavrov, a question was asked: “Why would’t Russia apply pressure on the United States to force them to support dialogue initiatives in Syria?”. Mr. Lavrov told his guests that no one can pressure the United States and that Russia will wait until the United States tries (and fails in) all other options before it decides, one day, to work with Russia on a more pragmatic solution. Today, the United states seems to be ready to give a green light for the “Moscow 1″ dialogue conference, sponsored by Russia in cooperation with UN and Swiss conflict resolution specialists. The conference is planned for early 2015. A transitional coalition government and a road map for an end to the Syrian crisis will be discussed. The easiest starting point to a solution is an agreement to reshape the narrative. Undoing the various claims to holding the moral high ground by the two sides would be a good start. Abandoning promises and expectations of imminent victory (also applies to the two sides) is another essential prerequisite to generating sufficient adoption for the dialogue option. Today, most Syrians are ready to reconsider their previously held beliefs and assumptions (dreams). They want progress and reforms, but will settle for evolution instead of revolution. Before we rush to subcontract the Syria division project to Mr. Erdogan, or to transfer authority from Damascus into the hands of a 1000 rebel groups, we need to give those who are working on genuine reconciliation a proper chance to succeed. Great article Camille. Truly one of the best . You know how I feel about Landis, but he has never stopped to amaze me with his promoting of dividing Syria from very early on in the conflict. I am one of those who you described as “Govt supporters “. . Proudly I am one of ” a United Syria ” supporter in reality and will always be. I would never accept any division or small sectarian states in my beloved country. Syria is 7000 years old of history of mixed cultures and religions .. A redhead from Oklahoma ( Landis ) and a Pakistani ( Zakaria) are not going to change that. We want another 7000 years to come ..
We might lose a little now, but the borders of the great Syria will forever be drawn in our memories .. And the memory of our children ..
And we won’t , not ever , settle for less .. This has nothing to do with what landis said about how every party is not willing to change .. And think it can win the conflict . There is nothing to win .. There is a country to save ..
Not the Kurds , not Turkey, not the Wahabies , or the Chechnyans and certainly not Landis , will be allowed to divide Syria. We will fight for a UNITED DEMOCRATIC SYRIA until the last day of our lives , and until our last breath… Our children will too .. I wonder how you could fell into the gimmicks of Landis.He is ,was,and will remain the echo of an american imperialism that wants at all cost to impose its “moral”,historic understanding of the others (how ironic for a country that is neither a nation nor has History).And he will always defend the rights of “Israel”to subdue its neighbors .Sykes-Picot times are gone ,never to return.One cannot rewind History at it own leisure. As for the european plan,it is obviously a new Trojan horse to finally control Syria.They have tried everything …and failed.A strong,centralized Syria is not In their interests.One has to see this in the bigger frame:a West in a terrible economical-financial crisis that desperately needs new economical markets and openings and to release the python like russian embrace in energy. How convenient then that Syria has been so brutally destroyed for the West to come to the rescue for the reconstruction(remember all the wet dreams and conferences for the reconstruction in the past years)and how coincidental all this data about the vast syrian resources in gas? Well now,with this decentralization process they envisioned there is still hope to get a huge chunk of the cake and to divert its own energy sources.But ,I bet all I can that Syria will be posturing.It is not a government decision but more a popular one that will overcome this kind of project which will if Syria is reluctant open the door wide for a partition in the future. I for my part don’t buy completely your version of events because too many documents,precedents and the sheer reality on the ground point to the fact that Syria is aggressed.This is the new type of wars if you do not want to risk a nuclear confrontation and this is the american response to the successes of the resistance in the region.Therefore all this whining by different syrian persons of the “opposition”is not very realistic.Who do they represent on the ground ?Thousands?Millions?or just themselves?This is not to deny that there was a huge discontent among the population about the very securitarian state and the corruption,among the passionately pro or contra government.And the silent ones.But today?How will you face the huge number of families who have lost a son /daughter in the army?the civil population that has been terrorized by the friends(the armed opposition) of Mr.Ford for almost four years?The ones that have lost everything? By parsing the government with a few of this “opposition”as Lavrov is suggesting? In my understanding of Syria there will be just one narrative that will NOT criminalize the armed opposition but rather a reconstruction taking the Nation as basis and giving its due to the government ,army and people .In the frame of this context the opposition will be assimilated.2014 is not 2011 and there cannot be any going back to the rigid paste. A small addendum:I always found fascinating and very characteristic of a thousand years old country that Ibn Taimima is buried quite in the same place as the Companions of Imam Hussein.This is Syria the country of assimilating par excellence!